[Contains explicit content] Season two of Lewis Black’s The Rant is Due brings you more listener rants, performed by America’s Ranter-in-Chief. This time with behind-the-scenes moments from the Lewis Black tour bus, as well as occasional phone calls to the people behind the rants. From hate for pickles to disdain for online dating, this show channels the rage of your 300 million neighbors and truly has something for everybody. 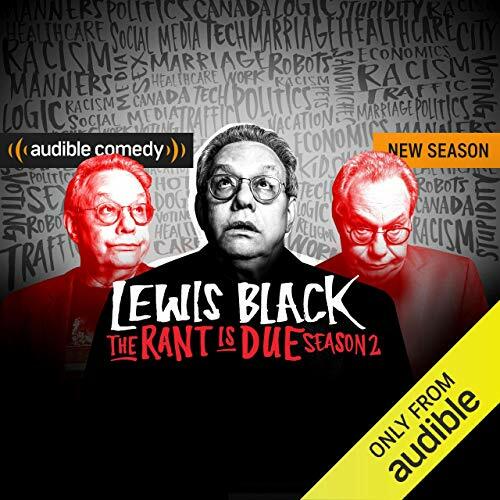 ©2018 The Rant is Due, Audible Comedy (P)2018 Audible, Inc.
Lewis Black is one amazing comic and my one wish is for the episodes to be longer! The Rant is Due Season 2 is great. I love Lewis Black but there is not enough content here to justify the price. You get intro and ending taking up time you paid for and the shows don't que. 5 mins is NOT a "show". I loved this! I needed that laugh!! it's been awhile since I have actually laughed! When I'm in a bad place and I need to laugh Lewis black is the best prescription. I can't wait to send in my rants! thanks for your time and I look forward to hearing more from you, I love the way you get the point across your funny and make the point. thanks for your rants! !